"Once, when he was partially relieved by the opiate, I slept, while Claude watched..."
The man who spent the last years of Samuel Clemens's life as one of his closest personal aides was his butler, Claude. Claude has remained a shadowy figure in Twain studies--perhaps because of the discretion often required from a man who serves in such a close capacity to someone famous. Even Claude's last name has remaine elusive for many years. Claude is mentioned frequently in Clemens's letters and in biographies written by others--always without a surname identification. Hamlin Hill in God's Fool identified Claude as "Claude Benchotte." (1) Hill's identification was most likely based on misinterpreting a handwritten "u" for a handwritten "n." Other scholars have assumed Hill got it right and followed suit. While recently probing 1910 and 1920 census records, the spelling errors have come to light and it is now possible to shed more light on the elusive Claude Beuchotte. The Stormfield burglary occurred in September 1908 and was reported in the New York Times on September 19. Additional insight into Claude's role in the household at Stormfield is provided by Karen Lystra in her book Dangerous Intimacy: The Untold Story of Mark Twain's Final Years. Lystra documents Claude's disagreements with Clemens's personal secretary Isabel Lyon. Shortly after the Stormfield burglary, Claude resigned because he could no longer tolerate working with Isabel Lyon. (5) However, as conditions within the Clemens household at Stormfield continued to deteriorate and as Lyon lost stature (and was eventually fired), Claude returned in the spring of 1909 with the understanding he would never have to answer to Lyon again. Lyon was later fired in mid-April 1909. 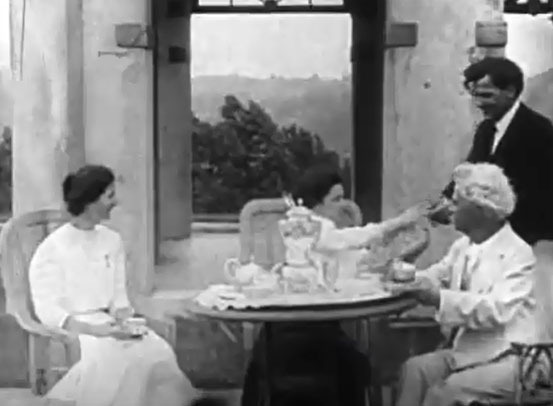 In 1909, Thomas Edison filmed footage of Clemens and his two daughters Clara and Jean at Stormfield. An, as yet, unidentified butler makes a brief appearance. Claude comes to Bay House twice a day to see if I need any service. He is invaluable. "I am going -- I shall be gone in a moment." 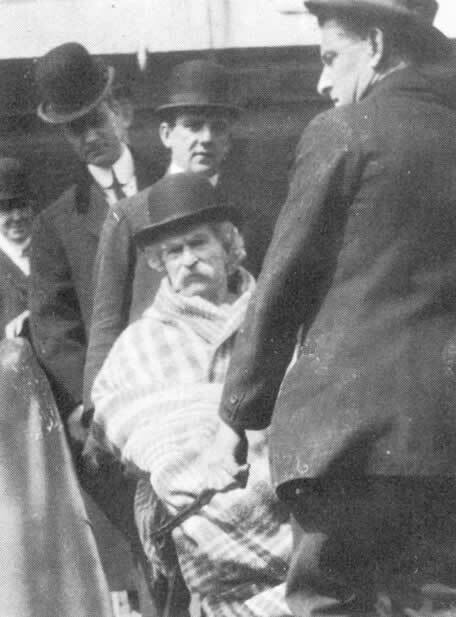 The last known photos of Samuel Clemens as he and his party arrived home from Bermuda. The identities of the men in the photos with Clemens remain unknown. It is possible one of them may be Claude Beuchotte. 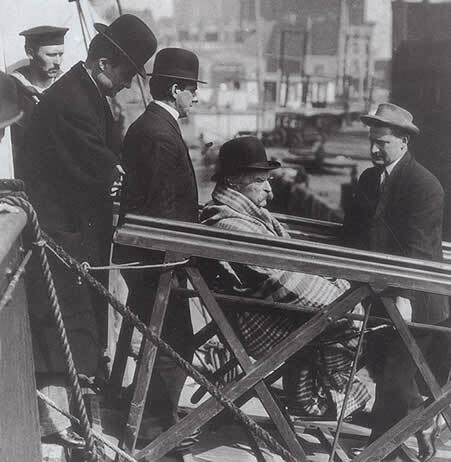 On April 14, 1910 Paine and Beuchotte returned from Bermuda with Clemens. When they arrived at Stormfield, they carried him upstairs to his bedroom. He died on April 21. The New York Times reported that Claude accompanied family members to Clemens's funeral in Elmira, New York. After the funeral in Elmira, Claude and Katy Leary returned to Stormfield with Clara and her husband Ossip Gabrilowitsch. On May 3, 1910 the census taker visited Stormfield and recorded the members in residence. Ossip Gabrilowitsch was listed as head of the household with Clara Gabrilowitsch, his wife. Ten additional servants and workers including Katy Leary and Claude Beuchotte are included in the household. Claude Beuchotte's name was recorded as "Claude Buchott". He was listed as an "alien" -- not yet a naturalized American citizen. The staff remained at Stormfield until August when Clara's daughter Nina was born. Nina was Mark Twain's first and only grandchild. The 1920 U. S. census listed Claude as a boarder in Katy Leary's household. The 1920 census taker spelled his name "Beuchotte" -- the first correct spelling of his name in U. S. census records. After Samuel Clemens's death, Claude was employed by the family of the late Henry H. Rogers to help oversee the family's Tabitha Inn at Fairhaven, Massachusetts where he worked for the next eighteen years. This ad for the Tabitha Inn appeared in the Automobile Blue Book for both 1917 and 1918. Special thanks to Kevin Bochynski for providing these ads. March 18, 1927 - Claude J. Beuchotte, proprietor of the Tabitha Inn, arrived in Fairhaven this week from southern France where he has been spending three months with his mother. He will reopen the Tabitha Inn on April 8 and is looking forward to a very busy season. October 21, 1927 - The Tabitha Inn, one of the show places of the town and a unit in the civic center constructed by the late Henry H. Rogers, has been sold to Mrs. Olive Barbier by Colonel Henry H. Rogers, son of the original owner. Mrs. Barbier, who has been employed in an executive capacity at the inn for the last six years, will continue in the same position. Claude J. Beuchotte, manager of the house for 16 years, will be retained in the same capacity. The inn, erected in 1904, has 38 guest rooms. December 9, 1927 -The Tabitha Inn closed its doors to the public Friday night. The manager, Miss Aline Barbier, and her assistant, Claude J. Beuchotte, will stay in town for about two weeks to put the place in order and close it for the Winter. According to Mr. Beuchotte, a number of regular Winter patrons have decided to go South for the season and the management could not take the risk of keeping the house open for transients during the Winter which follows on the heels of a very poor hotel Summer. November 1, 1929 - The sale of the Tabitha Inn is expected to be formally completed today. The new owner, Barney Zeitz, has announced plans to increase the capacity of the house by making some changes in the rooms formerly reserved for servants and using them as guest rooms. CEDAR BEACH INN, SOUTHOLD, L.I. rates daily or weekly. C. J. Beuchotte, Prop. The above ad appeared May 30, June 3, 8, 10, 13, 22, 24, July 6, 13, 15, 20, 22, 25, 27, 29, August 1 and 3 - 1934 in the New York Times. door. C. J. Beuchotte. Prop. Phone 239. The above ad appeared June 16 and 23, 1940 and June 15, 1941 in the New York Times. SUNRISE INN - Southold, L.I. able; $18 to $20 weekly. C. J. Beuchotte. After 1941, Claude Beuchotte disappears from published records. The exact date and place of his death remain unknown at the present time. (2) I am indebted to Jean Paul Beuchotte for kindly sharing his genealogy research with me for this article on his great great uncle. (3) Lawton, Mary. A Lifetime with Mark Twain; The Memories of Katy Leary, (Harcourt, Brace and Company, 1925), p. 216-217. (5) Lystra, Karen. Dangerous Intimacy: The Untold Story of Mark Twain's Final Years, (University of California Press, 2004), p. 153. (9) Paine, Albert Bigelow. Mark Twain: A Biography. It should be noted that Clemens likely misspelled the name of the "Sloane" family. Further research indicates that the correct spelling may be "Sloan." The family included Robert Sage Sloan, his wife Ethel Donaldson Sloan, and their daughter Miss Ethel Donaldson Sloan. Robert Sage Sloan, a retired naval officer who lived in Long Island, NY, was the son of Senator George Beale Sloan of Oswego, NY. Several items given to Miss Ethel Sloan by Clemens on the Bermuda trip were featured in an online auction in April 2007. (10) Paine, Albert Bigelow. Mark Twain: A Biography. (12) I am indebted to Carolyn Longworth at the Millicent Library for providing scans of the newspaper clippings.